UPDATED: Dec. 18, 2018 at 4:52 p.m.
Former University President Drew G. Faust has been named a University Professor, the highest honor a Harvard faculty member can recieve, the University announced Monday. 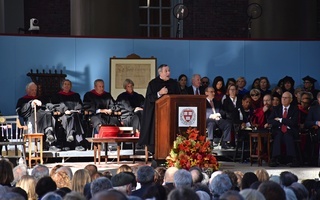 Faust joins 24 prominent Harvard faculty with the distinction — including former University President Lawrence S. Summers, former Harvard Law School Dean Martha L. Minow, and MacArthur “Genius” Grant recipient Henry Louis Gates Jr.
Faust, who served as University President from 2007 to 2018, will begin her appointment as the Arthur Kingsley Porter University Professor on January 1. She succeeds Helen Vendler, who stepped down on July 1 to become a professor emerita. 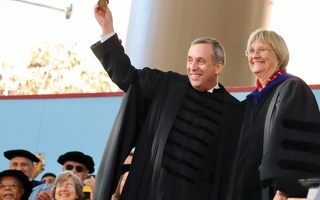 “I am deeply honored to join the distinguished company of University Professors and grateful to President Bacow for his generosity in appointing me,” Faust wrote in an emailed statement Tuesday. After serving on the faculty of the University of Pennsylvania for 25 years, Faust arrived at Harvard in 2001 as the founding Dean of the Radcliffe Institute for Advanced Study. Faust made history when she became the first female president of Harvard in July 2007. During her presidency, Faust — known for her measured leadership style — oversaw an unprecedented capital campaign that raised $9 billion dollars and set a higher education fundraising record. After weathering the worst financial crisis in decades at the start of her tenure, Faust went on to launch significant lobbying efforts in Washington D.C., meeting with lawmakers multiple times in 2017 to fight a legislative agenda that threatened Harvard’s finances. A historian focused on the American South and the Civil War, Faust is the author of six books. Her most recent book — “This Republic of Suffering: Death and the American Civil War” — was a finalist for both a National Book Award and Pulitzer Prize in 2008. Faust’s historical training came to the fore at times during her presidency. Though she warned against eliminating all references to many of the slaveholding families for whom buildings are named across campus, she led efforts to remove the Law School seal because of its connections to a slaveholding family and to rename the College’s House Masters as Faculty Deans. The former University President has also been honored by the Library of Congress, who awarded her with the John W. Kluge Prize for Achievement in the Study of Humanity in June. 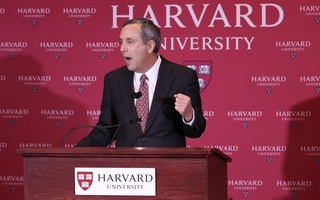 University President Lawrence S. Bacow, Faust’s successor, praised her achievement in an article published in the Harvard Gazette. Days after stepping down as University President in July, Faust joined the board of directors at Goldman Sachs. She will continue to teach as a professor of History at Harvard.